LG is finally ready to offer its long-rumored "rollable" OLED TV to consumers, announcing the OLED R.
Like the company's W-series of OLED TV, the 65-inch OLED R comes in a unique form-factor. However, unlike the "Wallpaper" design of the former, the R-series arrives in a sleek aluminum rectangular base that the screen can slide up and out of when needed and conceal itself between uses. This case also houses a 4.2-channel, 100W front-firing Dolby Atmos audio system. LG are talking up the OLED R as the first variable form-factor TV, with several different configurations available. As mentioned, the display of the OLED R can be mechanically "rolled up" inside the base when not in use. LG are branding this no-screen mode "Zero View". You can also choose to raise just the upper third of the display, with what LG calls Line View mode. This allows you to access the TV's Clock, Frame, Mood, Music and Home Dashboard. without fully unveiling the unit. 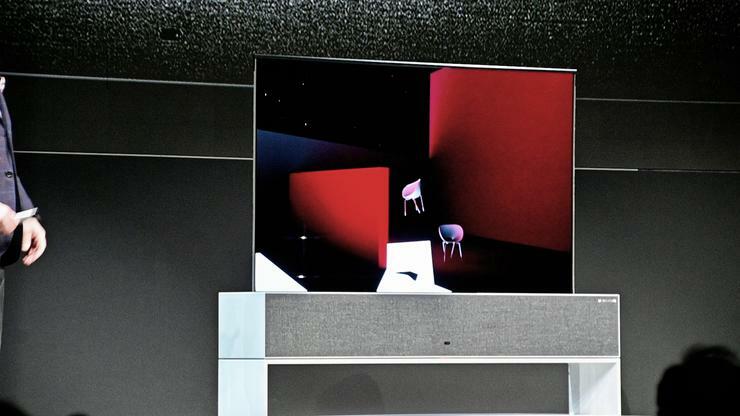 Though it's sure to be expensive, LG's OLED R looks like something out of science fiction. We can't wait to go hands-on with it later in the week. No pricing or Australian availability for the OLED R has been announced at this time.